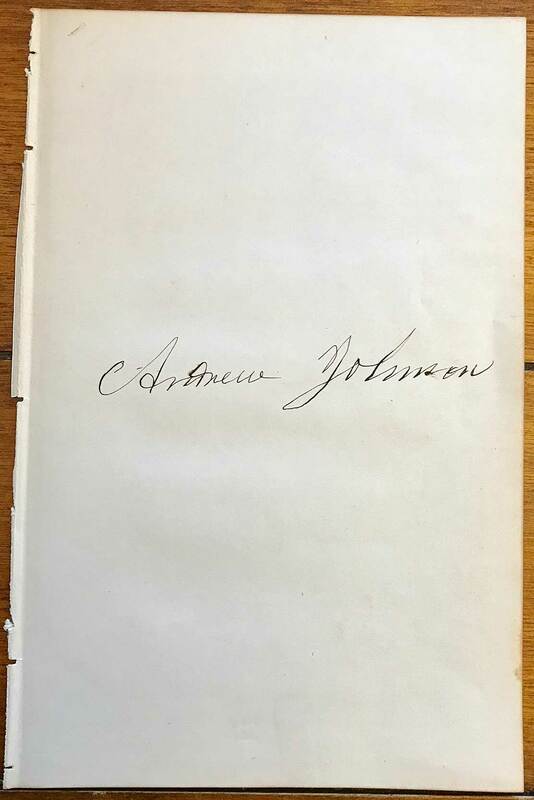 Beautiful Andrew Johnson autographed page. In superb condition, the page itself measures 7 1/2" x 4 7/8" and would frame beautifully. With the assassination of President Abraham Lincoln, Andrew Johnson became the 17th President of the United States (1865-1869), an old-fashioned southern Jacksonian Democrat of pronounced states’ rights views. With the Assassination of Lincoln, the Presidency fell upon an old-fashioned southern Jacksonian Democrat of pronounced states’ rights views. Although an honest and honorable man, Andrew Johnson was one of the most unfortunate of Presidents. Arrayed against him were the Radical Republicans in Congress, brilliantly led and ruthless in their tactics. Johnson was no match for them. Entering politics, he became an adept stump speaker, championing the common man and vilifying the plantation aristocracy. As a Member of the House of Representatives and the Senate in the 1840’s and ’50’s, he advocated a homestead bill to provide a free farm for the poor man. By the time Congress met in December 1865, most southern states were reconstructed, slavery was being abolished, but “black codes” to regulate the freedmen were beginning to appear. Radical Republicans in Congress moved vigorously to change Johnson’s program. They gained the support of northerners who were dismayed to see Southerners keeping many prewar leaders and imposing many prewar restrictions upon Negroes. The Radicals’ first step was to refuse to seat any Senator or Representative from the old Confederacy. Next they passed measures dealing with the former slaves. Johnson vetoed the legislation. The Radicals mustered enough votes in Congress to pass legislation over his veto–the first time that Congress had overridden a President on an important bill. They passed the Civil Rights Act of 1866, which established Negroes as American citizens and forbade discrimination against them.